From a pattern off Emily's website. I'm very proud of this cause it looked so very complicated from the instructions but actually very easy and meditative to do. Given as a Christmas present, 1998. Made out of 11's, crystals and fire-polished. 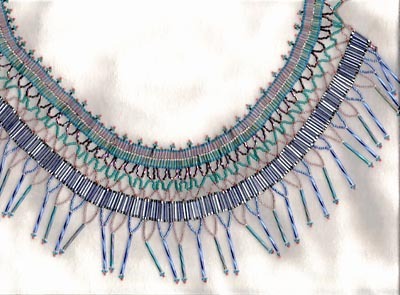 Has a lovely drapey feel, I want to do another one in blues for me, but haven't found the time yet. 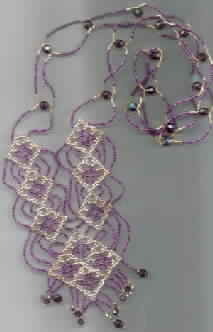 This is from Bead & Button # 17, pg. 18 by Bette Kelley, who attributes the basic steps to Virginia Blakelock. Completed Oct 1997, most of the beads were purchased from Betsy, it was my first major bead project and frankly probably more than I could chew at the time. ( my hubby learned some "new" words from me that I'm not supposed to know while working on it) I really love the how the netting and ladders work together so it's something I will play with more in the future. If you try it, definitely get big big holes in your beads! !